This DECT IP Phone W60P package brings greater scalability to cordless communication. With major improvements to the DECT base hardware (W60B), it scalable enough to support up to 8 handsets, 8 SIP accounts and 8 concurrent voice calls. The Yealink DECT IP Phone W60P package enhances communication productivity for on-the-move employees in industries such as warehousing, catering and retail as well as in factory settings. Small yet powerful, the DECT base W60B has upgraded hardware for powerful features, reliability and scalability. The W60 Package is a bundle of W60B base and W56H handset, which delivers top-tier audio clarity and battery durability. The W60P Package is an ideal DECT phone solution for on-the-go communication. 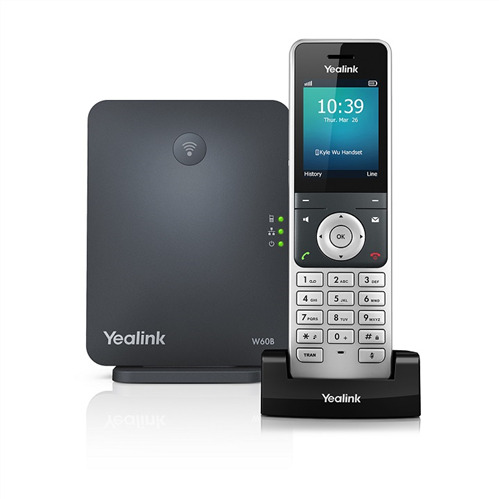 Paring with up to a total of 8 Yealink W52H/W56H DECT handsets, it allows you enjoy superb mobility and efficient flexibility immediately as well as significantly eliminates additional wiring troubles and charges. To provide a better and higher performance, this DECT IP phone not only supports up to 8 VoIP accounts and 8 concurrent calls, but also speeds up its startup and signal connection, slashes its upgrade downtime as well. By supporting Opus codec, W60 Package consistently delivers excellent and professional audio quality in both high-bandwidth and poor network conditions, comparing with other wideband or narrowband audio codecs. Offering the convenience of cordless with a simple add-on device without losing the SIP features, it brings a seamless call management for our users while “on-the-go”. Owning more functions, lines and mobility, it empowers users with the convenience of wireless communication along with the widely accepted benefits and feature richness of Voice-over-IP telephony. By supporting Opus codec, W60 Package consistently delivers excellent and professional audio quality in both high-bandwidth and poor network conditions, comparing with other wideband or narrowband audio codecs. Offering the convenience of cordless with a simple add-on device without losing the SIP features, it brings a seamless call management for our users while “on-the-go”. Owning more functions, lines and mobility, it empowers users with the convenience of wireless communication along with the widely accepted benefits and feature richness of Voice-over-IP telephony.